The Central University of Punjab is in a building state but the infrastructure pertaining to the basic science laboratories is almost complete for experimental work. The basic instruments like Quartz Double Distillation Units, BOD Incubators, Ovens, Refrigerated Centrifuge, Micro-centrifuge, Refrigerators, Deep Freezers, Spectrophotometers, Light Microscopes are available in these dust free air conditioned laboratories. The sophisticated instrument laboratory has advanced light microscope with digital imaging system, a latest next generation FSX 100 microscope for fluorescence microscopy, Gradient Thermal cycler, Real Time PCR, Electrophoresis units, etc. Tissue culture laboratory and cold storage room is under construction. Automated DNA Sequencer and Advanced Gel Documentation systems are being shortly added into the sophisticated Instrument Laboratory. 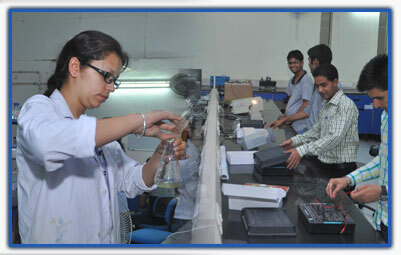 The students are individually encouraged to do more experiments. Well-equipped tissue culture laboratories for plant, animal, human and cell-lines culturing and a Molecular Genetics laboratory having 96 capillary 3730XL high throughput DNA sequencer, RT PCR, Gradient PCR, UV-Visual Spectrophotometer, automated karyotyping system, Electrophoresis units, Gel documentation system, high precision water baths, Ultra-low temperature deep freezers, high speed cooling centrifuges, Vacuum Concentrator, iNanoDrop 3000, CO2 incubators, and Millipore water purification systems have been established at the City Campus, to supplement the existing state of the art Biosciences, Chemical Sciences and Pharmaceutical Sciences laboratories. Walk in cold room facility with three different temperature regimes available for short and medium term storage of biological materials for periods up to ten years. A growth house and a screen house for multiplication and conservation of endangered plant species. 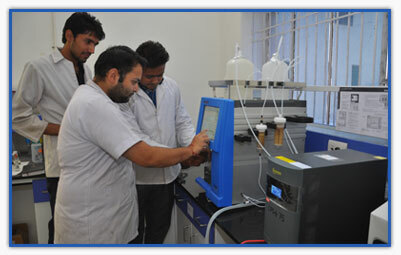 Atomic Absorption Spectrophotometer, Gas Chromatographic Mass Spectrometer, Fourier Transform Infrared Spectrometer and Microvoltameter have been added to the central instrumentation facility. Field-Emission Scanning Electron microscope, Confocal Laser Scanning Microscope with Fluorescence Correlation Spectroscopy and other sophisticated equipment being added as central facility. An air-conditioned Computer Centre equipped with over 150 desktop computers having latest software and high speed internet connectivity through a 1 Gbps lease line and another 20 Mbps lease line has been established. Six high-end work stations with 6-core processors, 3D graphic card, 8GB RAM for high capacity, faster computations and 42 inch LED monitors are there for molecular modelling and computer-aided drug designing. Blade Server with capacity for 16 blades. The present number of populated blades is twelve, each with 16 GB RAM.